Whatever your concrete or asphalt demands, we have a solution that meets your schedule and your budget. We do it all. Asphalt and concrete cutting, coring, scanning, repairs, maintenance, little driveways, big highways and anything else. We have trained personnel in each area and all the state-of-the-art equipment standing ready. All you have to do is call. We’ll do the rest, and we’ll do it quickly and affordably. CanWest is ready and able to assist you with all your concrete and asphalt problems as well as your demolition and excavation needs. We have experience on projects of all sizes, including road construction, major airports, commercial and residential work. A Can-Do attitude—we’ve never run into a job we couldn’t do! 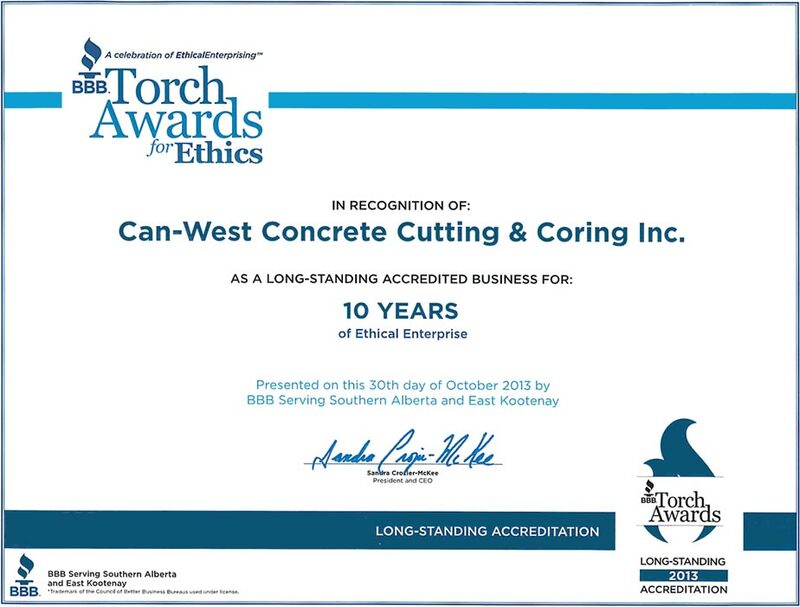 CanWest recieves BBB Torch Award. Hundreds of satisfied customers have hired us for concrete cutting, concrete repairs, road repairs, demolition and more. Our clients include some of the largest and most-respected names in construction, many of which have awarded us Prime Contractor status and Master Service Agreements. You can’t afford to trust your important project to a company that can’t deliver. From concrete cutting and coring to excavation or demolition, we have the experience and the resources to get your infrastructure, industrial, commercial or residential job done on time and on budget. Get a quick, accurate estimate for your project!